New Express contest from Ariel - Moments of clean! Clean is part of big things, it’s an ingredient for big successes (wearing a beautiful clean white shirt of the day of your wedding) and small achievements (getting rid of the grass stains on your son’s favorite hoodie). 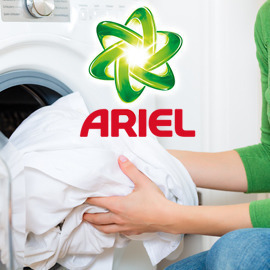 Ariel wants to understand what impact clean clothes have on your life. We’d like you to tell us stories that bring to life how impactful clean is, in order to emotionally move people. Create an inspiring poster that shows how Ariel’s superior clean has a great impact and can change small things… or everything! FORMAT - Print ad: Photo or illustration with text explanation (2 pages in total, PDF only). Join the contest and read the full brief! Send your ideas before April 15, 2015 23:59 UTC!